Shifts in energy can mean a push or a pull, an expansion or a contraction, a pressure or an easing-up, a barrier or a release (to name a few). Energy is not “good” or “bad”; it is not “positive” or “negative” (except as labeled by electrical charges). Energy is just energy, just as fire can burn, it can also warm on a cold night. The fire does not make a distinction in how it is used; it merely expresses the characteristic of fire. Understanding movements of energy is a subject of study in many areas: Neurology, and the electrical energies of the body; digestion and the movements of food (energy) through the digestive system, and the entire body; the study of the cosmos and the movement of planets, stars, asteroids, etc. ; the study of weather; the study of ocean tides; psychology and emotions; kinesiology and the movements of the body. Truly, everything is energy, and energy can be studied through its behavior, its movement. We can bring awareness and understanding to our own energy, our own behavior, thoughts, and feelings through recognizing the energy behind them. 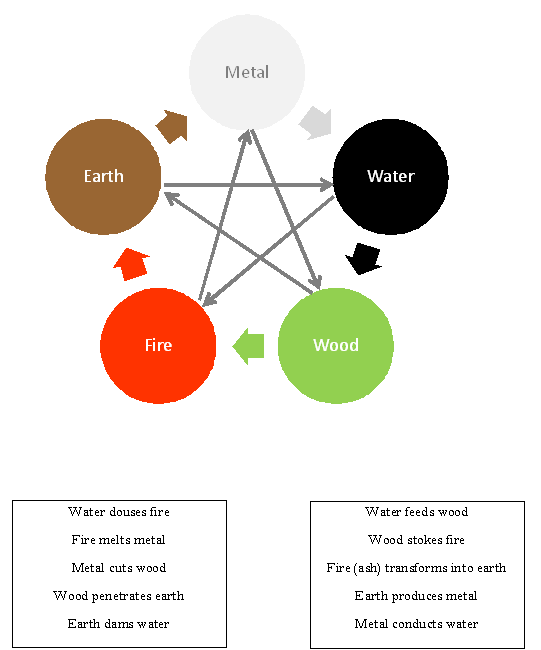 In Chinese philosophy, there is an understanding of all energy through an analogy with five elements: metal, water, wood, fire, and earth. There is a cycle of these energies, which depicts a flow, as well as an inter-relationship between them, which represents a blocking (click to enlarge). The center star-arrows depict the inter-relationship/blocking energy; the outer arrows depict the cycle/flow energy. In this philosophical system, you can see that energy is not about “good” or “bad”–it is all natural interactions that we can observe in nature. I haven’t been focused recently on the intention for this Journey–I guess I got pulled away from it. So, with this idea, I bring myself back to the intention of the Journey: Judge nothing. Everything is simply part of the ebb and flow of energy. I am part of that energy as it is part of me. Understanding energy in new and different ways (like Chinese philosophy) helps me to see and understand myself, my life, and my interactions in new and different ways, without Judgement. After all, I am responsible for my energy.